I’ve been inspired by Wright’s Dana Thomas house lately. Frank’s fountain windows and doors are something to ponder. They pull you in with a desire to inspect every detail. I stumbled upon a reproduction done by Thoennes Studios here and decided I need to start exploring and practicing similar patterns. I wanted to study the window. My goal is to pick out a few elements that would be a reference to the original design but be simple enough for a small project. There are plenty of images on the internet, and I had a few of Dennis Casey’s books as reference material. I settled on a design I made using Glasseye 2000 that was about 18 inches tall. While my design would take some effort, I thought it looked doable as a side project. 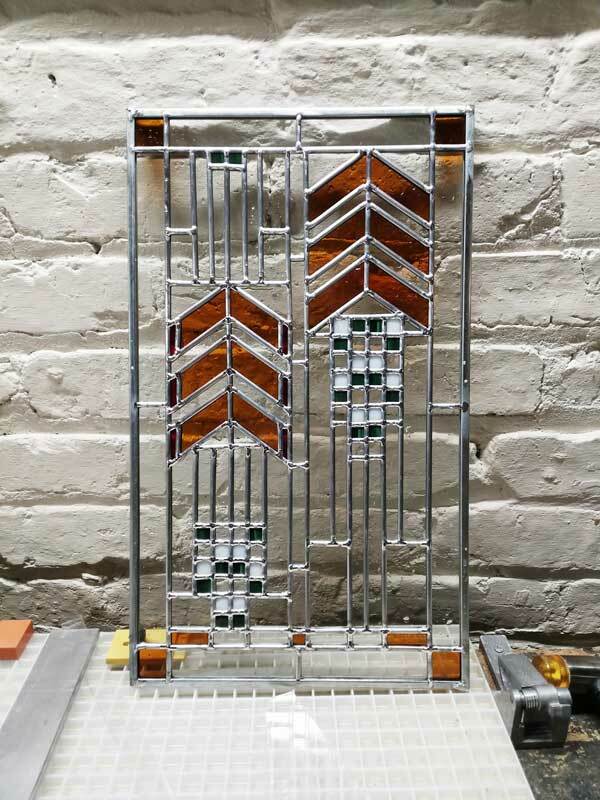 I’ve seen that some of the original works contain more than 700 pieces of cut glass, so my design with just over 130 pieces of glass seemed like a reasonable introduction. At the time I was hoping that I could get the 130 piece puzzle built in a couple of months. I always figure its better to set realistic expectations. Off to the basement studio with a printed pattern and a free afternoon to cut glass. Cutting the glass for this project was faster than I thought. I managed to cut all the pieces I needed in two glass cutting sessions. I would guess it took me around 4-5 hours in total. With the music going, I didn’t seem to require as long as I would have thought. Thanks, Sonos. 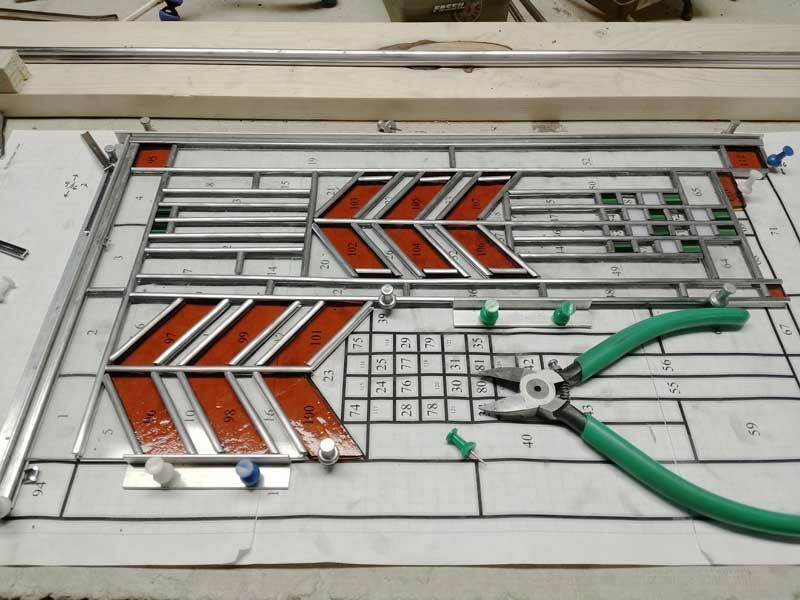 I used to do a lot of test cutting to check glass strip widths. That’s a good way of making mistakes with cheap repurposed glass rather than using my good stuff and having to scrap it. With time and practice, I’ve found that I’m getting more and more comfortable with trusting my measurements and the scales on my Morton glass cutting system. I don’t always feel the need to make test cuts anymore. There is one exception to that rule. I still like to make test cuts to check my angle pieces. If I don’t get those angles right, the pieces just don’t fit together the way they should. For me, it’s worth the extra few minutes up front to avoid frustration when I’m leading. It is amazing when you have free time. The more, the better. While I was working on this art glass panel, the stars aligned and I had two weekends in a row with a lot of free time. That meant I had two good weekends to commit to building my panel. The nice thing about prairie style work is that the leading process is straightforward. Squared off corners make for fast leading. I was able to move through the piece quickly and feel like I was making fast progress. I did feel like this panel had a bit too much play between the glass and the 5/32″ lead came. I’d love to get that sorted out for my next project. I have a theory that Glasseye is using a standard lead came heart thickness that is just a little too wide for the came I’m using from Cascade Metals. The current sizing seems to make things fit together a little too sloppy. I’ve already got a plan to test that. 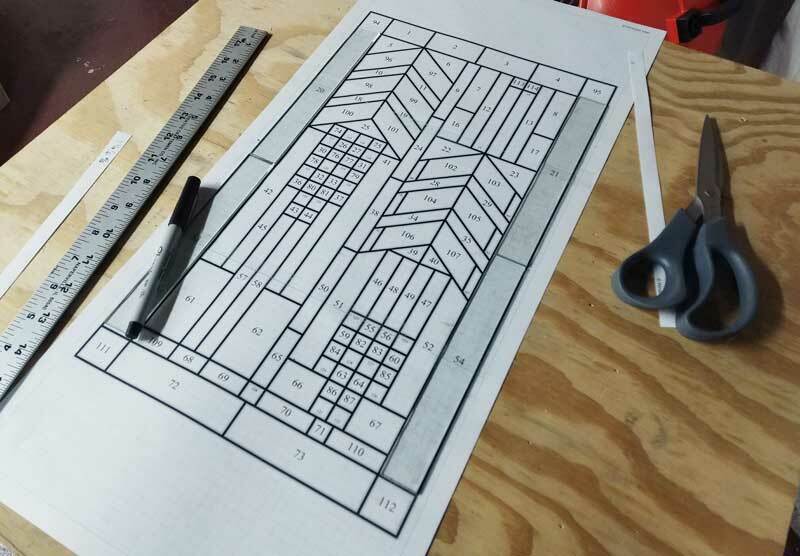 For my next piece, I’ve built a small panel design and switched over to metric units. I then changed the heart width of the design from the default 1.6 mm to 1.3 mm. From the few pieces of glass, I’ve already cut I think this could solve my issue moving forward. After two weekends of leading, I had a panel. I haven’t had it in front of a natural light source yet, but I think the design looks like it’s going to work out nicely. The final panel I did teach me a few things. I found two or three areas in the design that required a bit of adjustment for consistency and ease-of-build. I made changes to these areas on the fly while I was leading the panel. This morning I spent some time with the digital drawings to make the changes on the computer so I’ll have a better pattern for next time. I also learned that I should use a slightly larger zinc border if I don’t want to build wooden frames for a panel of this size. My intention for this piece was always to put it in a wood frame so I won’t have an issue. Even so, I’ll need to stock up on some quarter inch zinc U came since I’m currently out of stock. In addition to mudding the final piece, I’m designing a wood frame for the stained glass panel. I’ve got a new router edge going on order, so the project is on hold right now. In the meantime, I’ll be watching plenty of youtube videos to looking for additional pointers on how to best frames possible.